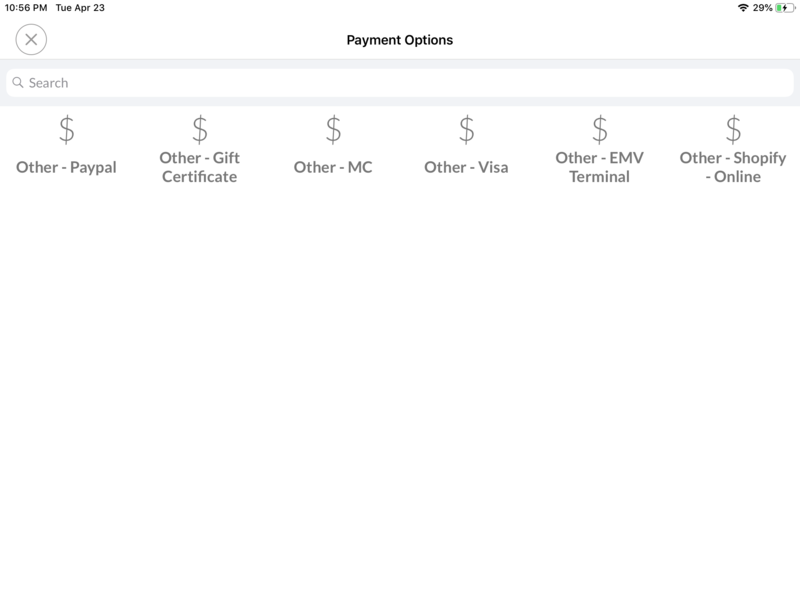 If you accept payment types or tenders that are not included in the default options on the payment screen you may want to utilize "Other" payment types. Some examples of common "Other" payment types are "Paper Gift Certificate" or "External Credit Card Terminal". You may add unlimited "Other" payment types, and all are accessible directly on the payment screen. 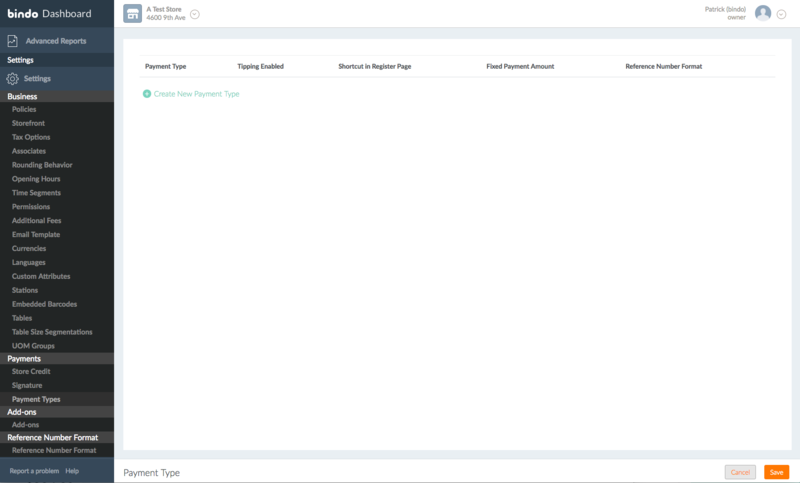 If you use an "Other" payment type to ring up a sale, that will be recorded as the payment type for that sale and will display in your reports. In the Dashboard, Click on Settings. Then click "Payment Types" underneath Payments. Click on "Create New Payment Type" and a blank line will appear with placeholder text "Enter Payment Name". Click on this line and type the name of the payment type you are creating. To add the payment type as a button that shows on the payment page check: "Shortcut in Register Page". To enable tip tracking for the payment type check: "Tipping Enabled". To add the payment type to be a fixed amount (the payment type will only allow this amount to be paid in a given transaction) check: "Fixed Payment Amount" and enter the amount in the corresponding text field. Click "Save" in the lower right-hand corner when you are done creating payment types. Once you have an "Other" payment type set up you can ring up a sale and record that payment type as tender for that sale. You may access these payment types from the Payment page. If you enable the option to "Display as shortcut in payment screen" the payment type will show as a button on the main Payment page. If not then access the payment types by clicking on the "Others" button. After you tap on "Others", payment types will show as in the image below. Tap on the payment type that you want to use for this sale. 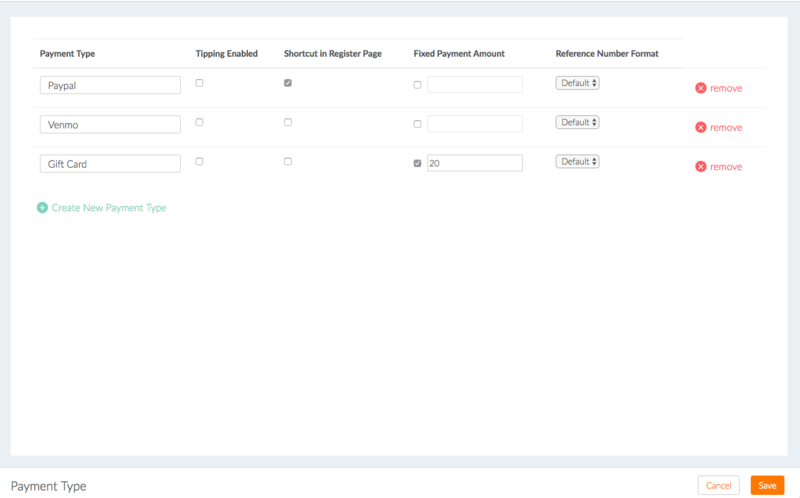 Whichever payment type you select will print on the receipt and show in your reports. They appear on the receipt and in reports preceded by "Other -". Note that while you may edit or delete "Other" payment types, any "Other" payment type that you have used to ring up a sale in the past will remain unchanged on past receipts and historical reports. Furthermore you may not edit the name of an "Other" payment type, only the associated settings can edited. To edit or delete an "Other" payment type go to the Dashboard. click on Settings. Then click "Payment Types" underneath Payments. Tap "Edit" in the bottom right-hand corner. Click on the name of an existing payment type to edit it, or click on the X to the right of the name and click "Remove" to delete it. 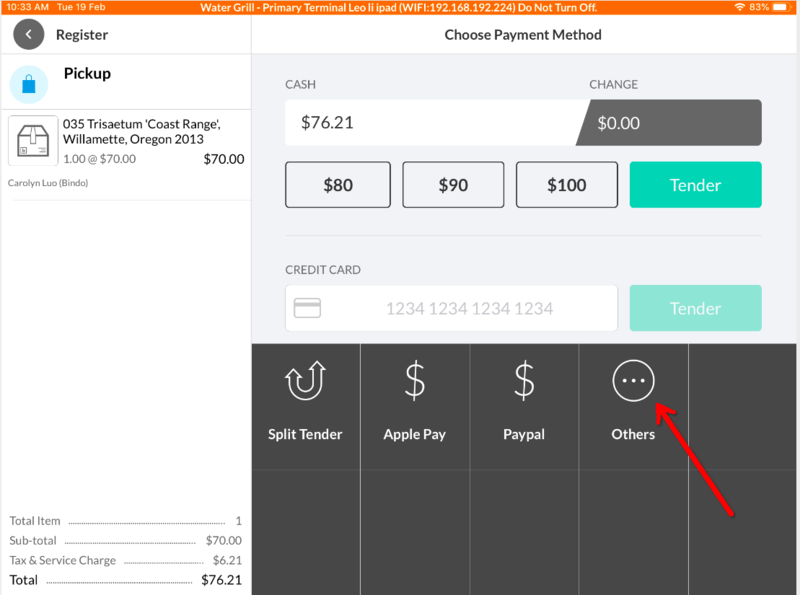 Click "Save" in the lower left-hand corner when you are done editing your payment types.